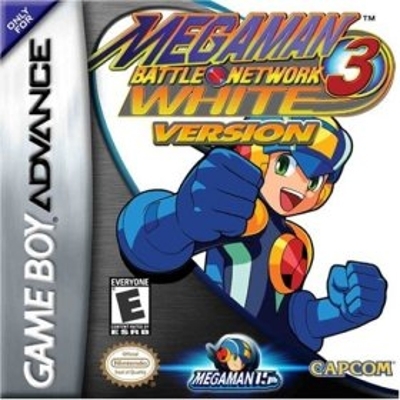 Megaman Battle Network 3 Blue(also in White) is the continuining unique RPG series set in a high tech atmosphere from Capcom. You play Lan who controls his Net Navi Megaman(also known as Hub). Lan and Megaman are more than just an operator and Net Navi, they are also friends. Dr. Wily must be stopped once again from taking over the Net, and ultimately the world. In towns, it plays like any other RPG in a camera view from the lower left hand corner. Battling viruses is where this release breaks from the traditional RPG mode. Megaman and the viruses are on a six by three grid. This grid is split down the middle. Moving Megaman around the grid to attack and avoid attacks keeps you on your toes. Before each battle you get to select battlechips to use in the battle. The same kind of chips can be selected as can chips of the same letter(example \'R\'). Chips range from healing items to swords. In addition Navi chips may be used for more devasting attacks. Battle chips can be found, bought, or dropped by defeated enemies. Control of which chips can be used is in a folder. A limited number can be in the folder at any one time. All other chips are left in a backup folder to be swapped in at any time(not in battle). The depth of strategy with the chips is enormous. There is some variance between which chips are in Blue, and which chips are in White. In addition Blue and White have a different boss to fight. MMBN does not have experience as many other RPG\'s do. Instead, upgrades to Megaman\'s skills and HP\'s can be bought or found. The way these upgrades are used is different from MMBN2 (the previous release). A screen with a grid is available along with different rules that apply to which kinds of upgrades can be in which areas. The colors of the upgrades are also a concern. Two upgrades of the same color can not be side-by-side. The depth of customization is amazing. The story is pretty engaging. The quests range from helping an extremely sick child waiting for a surgery(ala Make a Wish foundation), to competing in a contest to find the best Net Navi Operator. There are, of course, mandatory quests along with side quests. The quests vary enough, so none of them get stale. The end of the game ties up some loose ends from MMBN, and MMBN2. I will not spoil it, however give you a teaser that Lan\'s family history is revealed in relation to the Life Virus. The graphics are very nicely done in this game. Special attention was given to the character models as well as the backgrounds. Each different Net World has a unique scrolling background matching the theme of the current world. The sounds are nicely done, and the music is decent. There really was nothing in the music that had me humming the tunes, and there was no music I found annoying either. MMBN3 stands out in the RPG genre as one of the few series that does not lean on the crutch of magic. There is no magic in this game at all. There is also a minor story reference that Megaman is actually Lan\'s dead older brother, and his conscience was transferred to a computer. Capcom has proven with the MMBN series a good RPG can be created without magic in the game. This is one of the more family friendly RPG\'s on the market. The only issue of concern is the violence in the battles. Objectively looking at it, there is violence involved. All of it cartoon. Personally I did not find the violence bad. Viruses explode when deleted, and all are robot-like creatures. The way to delete viruses is with the megabuster. The megabuster is a gun on Megaman\'s right arm(or his hand becomes a gun). The player can shoot the enemies with the megabuster to take away their hitpoints along with the use of battle chips. An example of a battle chip is a grenade-like item that explodes several squares away from being thrown. Another example is a sword you swing (and must be in range of a virus for it to do damage). As an RPG gamer, computer programmer, and a Christian I found a lot to like in MMBN3. I think Capcom is going in the right direction with the series, and am thankful they are producing an RPG series with no magic in it. The level of complexity and depth to the system in the game is another thing I really liked. I spent hours getting my folder just the way I wanted it. There were a few times when it was tedious to mess with the upgrades for a certain quest. Thankfully those times were short. If violence bothers you, then you may want to steer clear of this game. Personally the deleting of viruses did not bother me, because that is how I saw it. I also think Capcom should be applauded for having quests like the Make a Wish foundation type of quest. There is also the theme of good vs. evil, and the importance of team work. I recommend this game to all who like RPG\'s, especially those who are tired of the same style of RPG\'s. God bless you, and thank you for taking the time to read my opinions.